Sarah Huttinger is a woman who learns that her family was the inspiration for the book and film “The Graduate” – and that she just might be the offspring of the well-documented event. THE REVIEW: One of my favorite films of all time has to be The Graduate. I remember watching it for the first time the summer before starting college and being blown away by just how accessible and exquisitely crafted the film was. The Graduate is a film I could watch on repeat without getting sick of it, as well as find something new with each viewing. Suffice it to say, I was more than a little surprised when I didn’t even know the film was based on a book and that book was based on a “true” rumor about a Pasadena, CA family. Rumor Has It… is the film based on that rumor. Benjamin Braddock is really Beau Burroughs (Kevin Costner) and Mrs. Robinson is actually Katherine Richelieu (Shirley MacLaine). 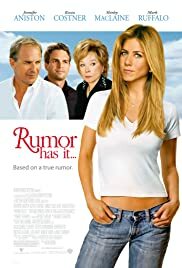 Having seen The Graduate so many times, it was interesting to watch Rumor Has It… and figure out how all the pieces fell into place and new relationships that are forged with new characters like Sarah Huttinger (Jennifer Aniston) and Jeff Daly (Mark Ruffalo). This story almost makes the film like a mini-mystery with a couple big surprises scattered throughout. As a comedy though, Rumor Has It… feels quite lacking and almost like an afterthought. Most of the funny moments only warranted brief chuckles instead of big hearty laughs, and now writing this review a few days after watching the film, I can’t even remember the moments I chuckled at (I’m guessing most had to do with the terrific Shirley MacLaine). For fans of The Graduate, you will most certainly find Rumor Has It… to be a wonderful film. It gives a new perspective on an old classic, and the twists and small mysteries embedded within this “new” story will keep you engaged. For others unfamiliar with the 1967 film or perhaps just looking for a nice funny comedy, Rumor Has It… will probably disappoint.